Confusion over Summit Coordinates, & Beast on Beagh? There is definitely something odd going on with the given coordinates for Slieve Beagh SE Top. Having read three5four0’s piece on the apparent error with interest, I found myself up there this week in the pursuit of another County Top. I also followed Harry Goodman’s clear route. The coordinates I captured at the highest point of Monaghan were H53185 43600 J. I reckon this is about 100 metres south of the given MV coordinates. However having been up there I feel confident in saying that my recorded gps coordinates are fairly accurate. I feel the MV coordinates would have you teetering on the edge of Lough Sallagh, if not actually in it! Lough Sallagh is definitely lower than the mound which I considered to be the summit. Why is accuracy important? What is 100 metres here or there? Well, as other contributors have pointed out, Slieve Beagh SE Top (and Slieve Beagh in general) is a remote, featureless, bleak expanse of undulating bog. It is beautiful in its stark nature. But it could be fierce and unforgiving to those who go there in poor visibility and who cannot navigate. 100 metres could be the difference between a successful County Top bagged or the start of an unexpected adventure lost in the wilds of Fermanagh, Tyrone and Monaghan! Be warned - this whole bog is wet, wet, wet! Every footstep sinks into the ground beneath the heather and grass. It must be supersaturated, and it means the effort required to trudge over the heavy ground is more than might be expected. 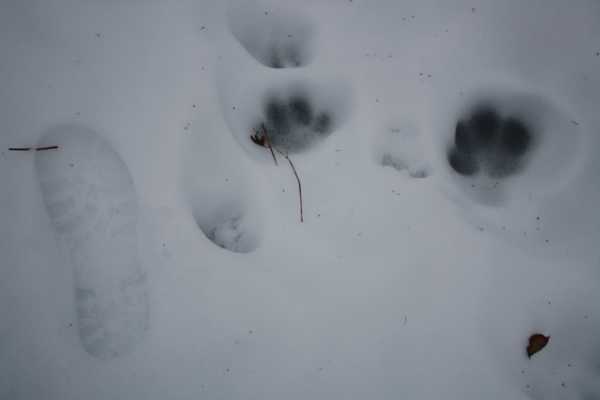 Speaking of footsteps – I came across very large animal prints in the snow on the track leading past Lough Antraicer. They looked like giant cat prints. I took a photo with my own footprint next to them for size comparison. My wife assures me they are dog prints, and now thinks I have walked alone in the hills for long enough. But there were no other human or animal prints with the footprints. Would a lone dog be likely to walk up here by itself? Maybe I have walked alone long enough! !